Diet is just as much a part of fitness as exercise, and what you eat will affect every aspect of your workout. A proper diet also influences the results of you fitness plan, since it helps build muscle and decrease the percentage of fat in your overall body weight. What you eat after a workout is undeniably the most critical meal of the day. After workout meal should comprise of the right foods to support your body to repair, replenish, repair and rebuild. This way you can maximize the results of your exercising efforts. Here are 3 most crucial do’s of what to eat post workout! (i) Do Take Whey Protein: Strength training breaks down your muscle tissues. Supplementing with easily digesting quality protein provides your body what it requires to repair and rebuild your muscles sturdier than before. 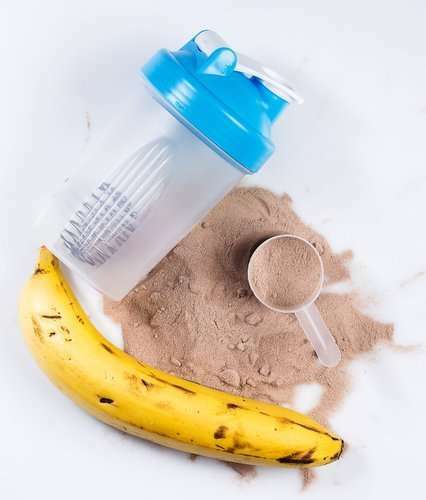 Whey protein can be absorbed swiftly by your body (unlike slower proteins like casein, soy or hemp), that’s why whey isolates and hydrolysates are the best post-workout option. (ii) Do Eat Simple Carbohydrates. When taken after a workout, carbohydrates restock muscle glycogen, essentially needed immediately after work out to help repair and gain muscle mass. And in case you don’t intake carbs in your post-workout recovery meal, your body may instead really breakdown existing muscles. In fact this is the only time when simple carbohydrates (so called. the bad carbs such as the ones found in many cereals and fruit juices) are recommended. (iii) Do Prefer Liquid Foods Over Solid Meals: Though solid meals are surely more balanced, nutritious and delectable, but they have a propensity to get absorbed slowly. Undoubtedly, a plate of chicken and potatoes has hordes of protein and carbs – but it’s not going to get absorbed as speedily as a protein shake. Here are 3 most crucial don’ts of what to eat after working out! (i) Don’t Consume Fat – Even Healthy Fats: As time is of the essence, you should not intake anything that slows down the digestion of vital nutrients. Fat (even good, heart-healthy fat) does impede absorption, so it’s wise to go for food choices that have least fat content. (ii) Don’t Intake Foods With Having Lots Of Fiber: Just like fat, fiber also delays the digestion of food. No doubt fiber is really a very useful part of your overall meal plan (particularly for those who are striving to lose weight, since it makes you feel full); a post-training meal isn’t the right time to include it. (iii) Don’t Wait: For post workout meal time is of the essence. Professionals concur that sooner you take nutrition after workout, the better. You can carry your post-workout nutrition to the gym so that you take it immediately after workout. Don’t allow your window of opportunity bypass! Total Fitness Tip: Go for a banana immediately after training. Then let your body has a break of about 20 minutes before you take whey protein (preferably, ISOLATE with water or skim milk). Your system will immediately start processing the sugar in banana or other fruit of your choice and begin pumping insulin, which takes a while. When finally you swig the whey protein shake a while later, insulin will be present in your blood stream and all set to drive it into your muscles. Eat your solid meal 60-90 minutes afterwards.